1. Suspended redemptions have been reduced somewhat, but still remain at 6.4%. 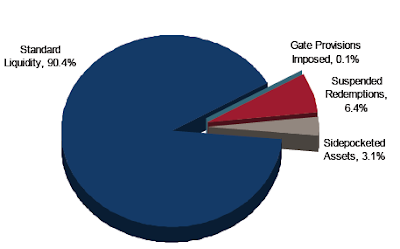 Funds that suspended redemptions (vs. putting up gates) tend to be those who are really in trouble. Many of these funds are now in liquidation mode. 2. The bulk of the "gates" have been lifted. Gates were put up by some of the top funds including D.E. Shaw, to protect the non-redeeming investors (and themselves) from a fire sale. Now as the performance improved and the wave of redemptions has slowed, these funds are opening gates and redeeming investors who wanted out. 3. The use of sidepockets has increased considerably. Funds who had sidepocket capacity, used it to the fullest, putting as much of the illiquid or hard to value assets into their sidepocket account as possible. Investors can not redeem out of sidepocket accounts until assets are monetized, which could take years. As a result of the forced selling and de-leveraging process that occurred in 2008, many hedge funds were forced to impose liquidity constraints in an effort to manage or restrict a surge in client redemption requests. 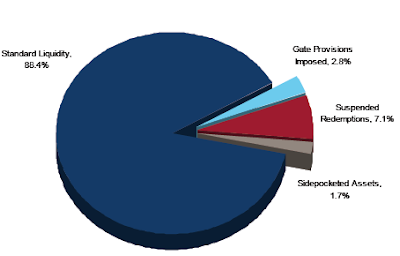 We currently estimate that by assets, 9.6% of hedge fund AUM can be classified as “impaired,” meaning suspended redemptions, imposed gate provisions or sidepocketed assets. This is down from the estimated 11.6% of total industry AUM which was impaired as of December 2008.7 As the market sees a return to what many consider to be more favorable conditions, we expect to see the liquidity profile of the overall industry improve.